This is an easy, one pot dish. It does take a while to cook the tomato sauce, so it's excellent for a Sunday afternoon when you want to put dinner on and curl up with a book. We are having a big windstorm in Victoria and things are thumping and bumping around outside. It is a rather blustery day. Exactly the sort of day when you should slowly cook something on the stove that will fill your house with the best garlicky-tomato smell while you hide out under a blanket and listen to the wind rattle the windows. 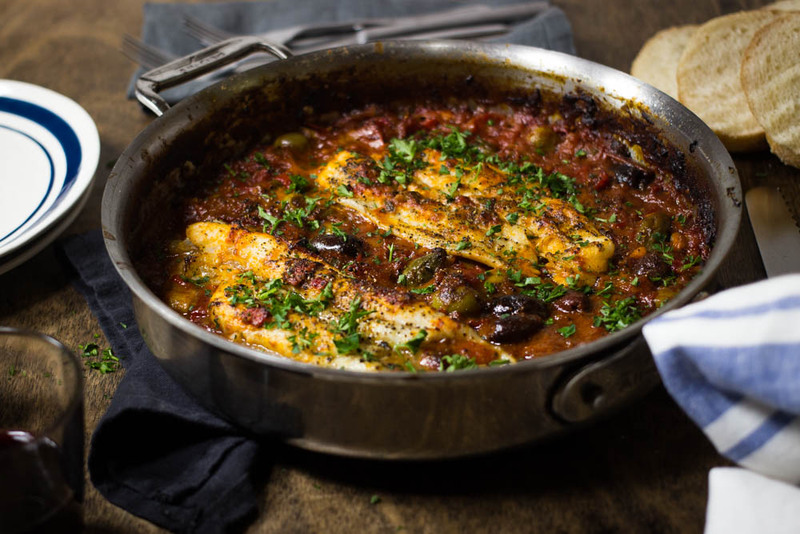 The tomato sauce cooks for about an hour and once it's thick and rich, pop in the fish and cook for a few more minutes. Serve with some crusty bread to scoop up all that sauce. In a large frying pan on medium heat, sauté garlic and shallot in vegetable oil, stirring occasionally until they soften and begin to brown. Add anchovies, salt, pepper, chili flakes and jalapeno. Cook for 3-4 minutes and add tomatoes, sweet peppers and olives. Reduce heat to medium-low and ook until the peppers and tomatoes are broken down and form a thick sauce, about 40 minutes to 1 hr. Add lemon juice, paprika and cumin and stir to combine. Preheat the oven to 400°. 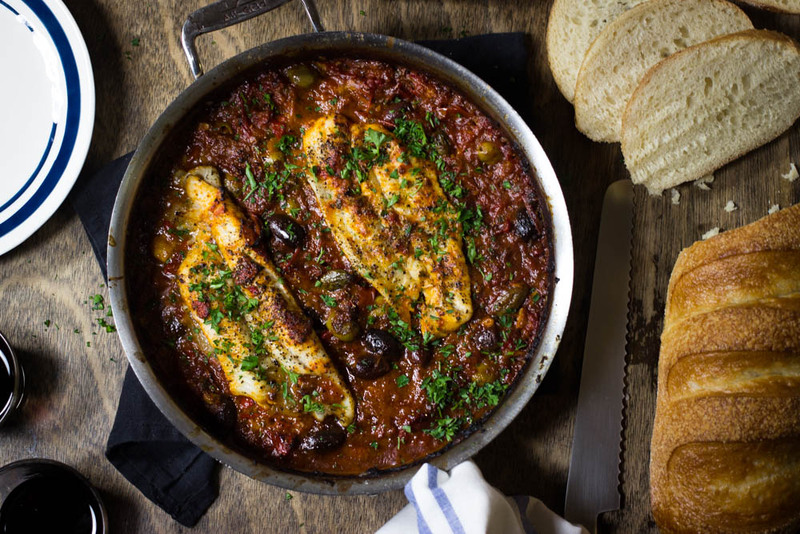 Lay fish on top of the tomato sauce. Spoon a little sauce over the fish and sprinkle with salt and pepper. Roast in the oven until the fish is flaky and no longer translucent. Serve with some crusty bread.